The Chicago School of Professional Psychology, one of the leading universities devoted exclusively to psychology and related behavioral health sciences, has published a compendium of research supporting the need to treat individuals and families with a holistic approach that integrates the medical diagnosis with a psychological evaluation. Mental Health is central to the well-being of every society, carrying with it an enormous impact not only on emotional but physical health, often far more than realized. 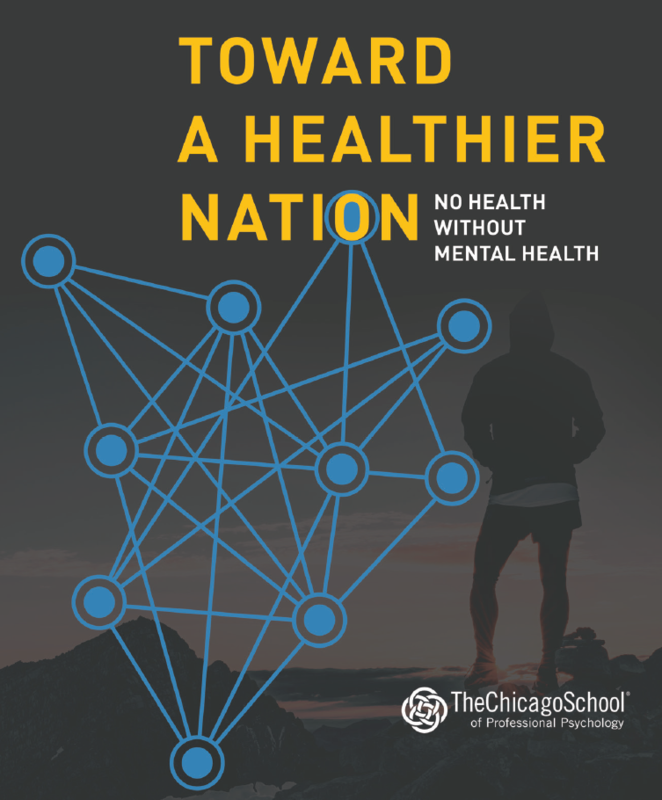 The report entitled, Toward a Healthier Nation: No Health Without Mental Health, also highlights the need for culturally competent professionals who can address the growing diversity in the country, and the increase of new hidden health stressors in everyday life. Toward a Healthier Nation is a national report on the status of mental health. It examines three promising approaches embedded in the Affordable Care Act (ACA). Each area has the potential to be “a game changer” in how mental and physical health issues are addressed: strategies to prevent common concerns from escalating into health-threatening challenges; the use of inter-professional teams to treat health issues from combined physical and psychological perspectives; and the use of technological innovations and applications to provide an additional layer of day-to-day support. The new report identifies four real life stories that support the research findings. The areas of focus offer clear, straightforward evidence of how our mental health and physical health are inextricably linked. Each story demonstrates the hidden impact of stress and cultural pressures on American families. These stories were selected because the reader will recognize a relative, friend, or coworker. Mental disorders, especially depressive disorders, interfere with our ability to manage many chronic diseases such as cardiovascular disease, asthma, obesity, diabetes, and cancer. Disease increases the cost of care and severity of the illness. High levels of stress and mental health conditions such as anxiety and depression lead to unhealthy behaviors such as smoking, substance abuse, physical inactivity, and insufficient sleep. This mix puts us at risk for many chronic diseases. Psychology professionals have not only done the research, but have witnessed the harsh realities of the failure to care for the whole person during office visits, in hospitals, schools and prisons, and on the streets of our communities. This three-part report argues for the critical need to address mental and physical health issues, presents the evidence supporting the link between mental and physical health (Section Two), and discusses promising approaches for the community to work together to reach definable goals. The report is designed to advance the way psychology and medicine are practiced, to educate policy makers who are preparing to revise the ACA and to bring corporate America and the media into a conversation that concludes that there is no health without mental health. We hope Toward a Healthier Nation: No Health Without Mental Health will result in an expanded conversation involving the greater integration of health care systems and the increased use of inter-professional teams in treating patients holistically. Together with other promising solutions discussed in this report, we will be able to focus on prevention, the increasingly important role of community services, and the leveraging of the benefits of technology in health care delivery. We are confident that the United States can begin to close the gaps in health and mental/behavioral health care access and improve the lives of its citizens.